As the number of commercial trucks and big rigs continues to increase in number and share highways with passenger vehicles, it is not surprising that truck accidents have also increased in the last few years in the Stuart Area and across Florida. Due to the size, force, and momentum at which these large-sized trucks hit passenger vehicles, catastrophic collisions are inevitable leading to serious injuries, permanent disabilities and even fatalities. 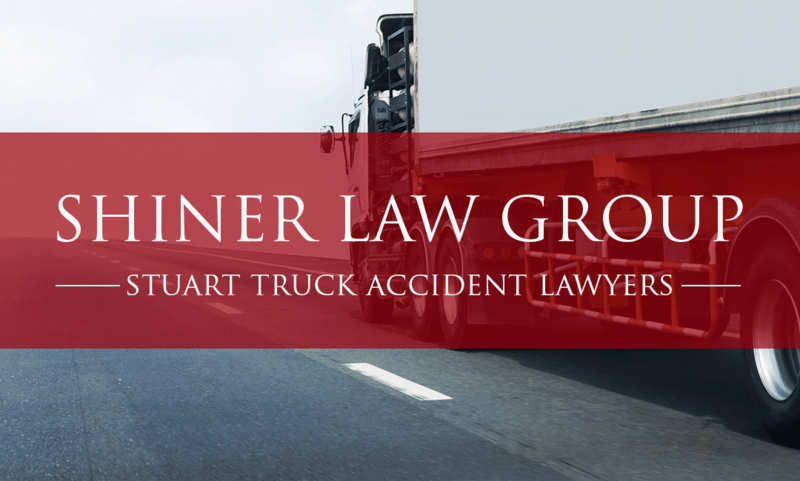 If you or your loved one has been severely injured in a truck accident, then you should seek legal representation from an experienced Stuart truck accident lawyer right away. A lawyer can fight your case and make sure that you get a fair and full compensation for the losses, injuries, pain, suffering and property damage incurred. An experienced lawyer can establish and justify liability against the responsible parties by investigating the case in detail and determining the actual cause of the accident. Even when you have taken all safety measures and if you’re following all the traffic rules, you’re still not 100 percent safe as you can get hit by a speeding truck. Due to pressing deadlines, truckers tend to drive heavy trucks that can weigh about 40,000 lbs above the speed limit, which can be dangerous for other drivers on the road. According to a study, a 40-ton truck moving at a speed of 70mph speed needs at least six-hundred feet to slow down and eventually stop. This shows that a truck can’t just stop instantly even when the brakes are pulled right away, thereby increasing the risk of accidents. In order to make more money and meet deadlines, trucking companies are willing to bend the rules and force truckers to drive for more than the legally required hours as recommended by FMCSA. As they drive for more than 11 hours regularly, this eventually results in sleep deprivation, which causes fatigue and loss of control over the truck—thereby causing accidents. In order to keep themselves awake for longer hours and to continue driving without any rest breaks, many truckers heavily rely on drugs. Needless to say, driving under influence leads to error in judgment and thus resulting into an accident. Poor vehicle maintenance is also a common cause for truck accidents. This usually happens when truckers are under so much pressure to achieve their targets that they are willing to skip pre-trip and post-trip truck inspections. Therefore, when they fail to comply with a preventative vehicle maintenance program, they are unaware of the defective parts of the truck like tire blowouts, poor brakes and issues with the wheels. Regardless of what type of a truck you get hit by (cement mixer, tanker truck, semi-truck or a delivery truck), the accident is most likely to be devastating. This is due to the massive size of the truck and the force it hits you with. The statute of limitation that deals with truck accidents is the statute of limitation for personal injury. In Florida, for the victim to get compensated for the injuries and losses incurred in a truck accident, they are required to file a personal injury claim within four years starting from the date of the accident. If the accident occurs because of poor road conditions then the victim has three years to file a claim against the government agency or state. Also known as PIP, this is a type of auto insurance that is a must have in Florida. This insurance provides injured drivers quick medical coverage of approximately $10,000, thereby reducing payment delays and ensuring that the injured driver receives proper medical treatment in a timely manner. This coverage is designed to protect drivers when the other driver either doesn’t have adequate amount of auto insurance or none at all. It functions as bodily injury automobile insurance coverage. Uninsured motorist coverage provides coverage to the policyholder for damages caused to them by the negligence of the other driver that doesn’t have insurance while Underinsured Motorist coverage comes in handy when the negligent driver’s insurance coverage is not adequate enough to pay for all the injuries caused. The value of the property damage claim basically includes the repair cost and a rental car during the time it takes to repair or replace your vehicle. Depending on fault and available coverage, it will determine whose insurance company you will demand to repair your vehicle and provide a rental car. As per the no-fault insurance law, under the PIP, victims are entitled to coverage for 80 percent of reasonable and customary expenses for medical care up to $10,000 only if the victim seeks treatment in 2 weeks. Therefore, it is important that you seek medical treatment within 14 days of your accident otherwise your insurance company shall not compensate you. If the victim dies in the truck collision then the family of the deceased can file a wrongful death claim to get compensated for the loss that they have incurred. This claim must be filed within 2 years starting from the accident date. Evidence collection — Chances of losing quality evidence like driver’s log, black box and GPS are high in truck accidents as the trucking company diligently tampers will all the evidence before you know it to minimize their liability claim. However, if you hire our lawyer right away, they can visit the accident scene immediately and conduct an investigation to collect compelling evidence that can prove fault, determine the cause of the accident and assist you in achieving a fair and full settlement. Assistance with paperwork for case filing — Our Stuart truck accident lawyer can assist you from start to finish. We can assist you with paperwork for case filing and make the entire process smooth, efficient and stress-free. As we take care of all aspects of your case, you can fully focus on getting better. Protect your rights — Our attorney will fight your case relentlessly and aggressively to protect your rights and make sure that you get compensated rightfully for losses and injuries incurred.